If you’ve spent any time in Philadelphia you’ve probably heard of Bucks County. Nestled just outside the city, Bucks is known for it’s quaint little towns and country feel. It’s a place where you can still find downtown areas that are filled with vintage antique stores, community theaters, and plenty of entertainment venues, making it a perfect destination for a long weekend girlfriend getaway. While staying in a hotel is always an option, there are just too many adorable Bed and Breakfasts that will really show you why so many people choose to live in Bucks County. Barley Sheaf Farm is my favorite, I loved watching the sheep roaming in nearby meadows, and the inn offers up fantastic service including an early evening wine and cheese. Highland Farm and Maplewood Farm are also excellent choices in the area. One you are checked in, you can check out the local entertainment and dining options at Puck Live, Havana, Keswick Theatre, or go native Moroccan at Casablanca in Warrington where you’ll enjoy live belly dancing while eating traditional Moroccan fare. After chatting the night away with the girls and a leisurely lie-in, it’s time to see what Bucks has to offer in Doylestown and New Hope. The best lunch special in town is at Spice Thai on State Street in Doylestown, you’ll pay less than ten dollars for a soup or salad and choice of entree. Arrive early and park downtown so you can explore the shops and architecture before you eat. Doylestown really comes alive in the evenings, so if you see a place you’d like to visit again, you can adjust your plans. One of the few towns that can compete with Doylestown is New Hope, the town is nestled along the riverbanks and the views of the Delaware River are breathtaking. As you head down Route 202, there are plenty of antique shops, the New Hope Winery, and a large outlet center in Peddler’s Village. Once you enter New Hope you can enjoy drinks on the deck at Logan Inn and settle in for spectacular people watching, then head over to Martine’s to unwind while watching the river sweep by, or grab dinner at Marsha Brown’s for authentic creole food in a renovated church. For evening entertainment there is plenty of live music to be found or you can make your way back towards Doylestown for a show by the Town and Country Players or find an independent movie at the County Theater. While not exactly Bucks County, the neighboring county of Chester offers some highlights just a short drive away that you don’t want to miss. Following Route 1 down to Chaddsford will take you to Terrain at Styers, a unique garden and home shop that maintains a full calendar of events like bonfires, wine tastings, craft classes, and a cafe where you can grab lunch. As you continue down the highway make a stop at Chaddsford Winery for a tasting and tour. During the winter months they’ve opened an outdoor snow bar where you can taste hot mulled wines to take the chill off. 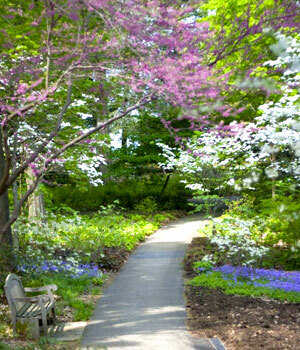 Just a mile down the road you can finish off the day with a tour of Longwood Gardens. Built by Pierre Du Pont, Longwood contains over 1000 acres with 40 distinct gardens including several fountain gardens. Stroll through the conservatory featuring 5500 types of plants including a spectacular lily pond, orchid room, and a 10,000 pipe organ that has just been restored. Longwood hosts classes, festivals, plays, concerts, plus daily fountain shows including evening performances set to music and sometimes fireworks. It’s finally time to relax before heading home. If you are staying at Barley Sheaf, take advantage of their full service spa features before checking out. Skin n Tonic in Peddler’s Village is another option that has an extensive list of spa services as well as fun classes and specials. Once you and the girls have had your fill of pampering, you can grab a bite at one of the fantastic restaurants in Peddler’s Village before heading home. Milan has her own blog at We Vacation for Free and her family of six have saved over $14,000 vacationing by home exchange over the last 5 years. Follow her on Twitter @HomeExchangeMom for tips on how to find house swaps for your family.